Paradise to Nightmare in a split-second, Heaven to Hell in a heart beat... How many of us have felt our hearts drop to our stomachs as we realise one of our community has gone down. Circles of fate - or, some would say, inevitability - begin to tighten around us. A crushing realisation descends that, this time, one of us is in trouble. The initial horror, panic and disbelief is nothing compared to what follows, I promise. There are pitfalls aplenty on the prison roller coaster; but if we support each other, we can perhaps ride a wave of calm through the panic. We can survive, and in the process help each other to survive. Caught in the Headlights like a Rabbit or Called to Action? At times like this, when there has been a seasonal uptrend of farang getting arrested - all of them going through the Police Station - Jail - IDC route to eventual deportation, it’s time to put all the information in place for those wishing to help their friends. Prison drinking water supply is tap water only, unless he has money in his account to buy bottled water. Aim to buy your friend a 6-pack of water every time you visit him. Costs 72 baht at the prison shop. For examples of what to buy at the prison shop - and how to buy it - see: How to buy inmates food and water. NB: You can only buy items from the prison counter. No goods from outside are allowed in at all - unlike at the police station, where you can take in what food you like. Don’t be a jerk at the police station and think you can have one over on the guards. They have seen every trick in the farang book, and it is naive at best - and dangerous at worst - to think otherwise! It’s also worth remembering that loud voices, anger and wild shows of emotion at any government institution will often make matters worse for those left behind bars. Keeping a calm head and smiling your way through adversity is the best favour you can do for your friend, even though it surely isn’t a laughing matter. 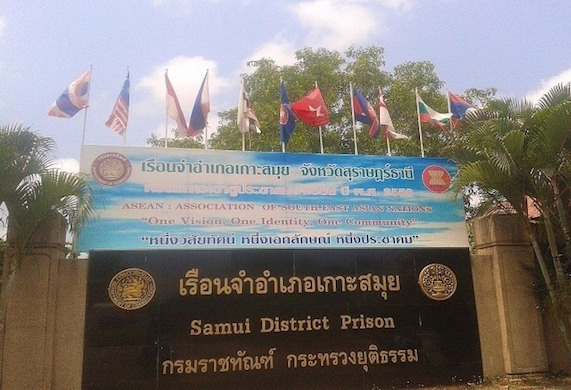 Visiting hours at Samui Prison are Mon - Weds - Fri, morning and afternoon. Arrive by 8.30am to register for morning visits, and 12.30 for afternoon visits. For a full guide see How to Visit Koh Samui Prison and to know what your visit means to another read What To Expect On A Prison Visit. Details of Chumphon Prison are here, as is the Lomprayah ferry timetable. Visiting is 8.30am - 4pm, closed weekends. If you’re taking food and water to Bo Phut police station (near Chaweng Lake), visiting times are 8 - 9am, 12 - 1pm & 4 - 5pm. Always stay polite and keep smiling, even when you are made to wait... or when things aren’t going your way. The last port of call is How to Visit IDC - Immigration Jail in Bangkok. Everyone goes through here before being deported to their home country, lucky them! As the days and weeks go by, you may find yourself thinking of your friend. 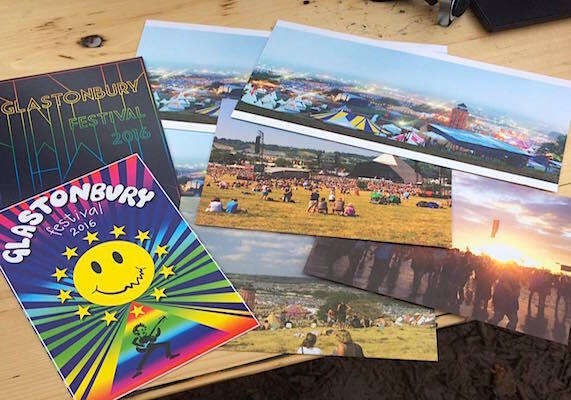 It will take half an hour of your day to buy a postcard, then sit down and write it - but that half hour well spent may keep someone inside going for weeks. There is a fully active PO Box in Lamai which is used by inmates to send letters to friends and family. 10 letters were received in the last week. All that is needed is an email or Facebook contact, and letters are sent quickly to their worldwide destinations. If you are on the Thai islands, it costs 3 baht to send a standard letter or postcard. All you need is your inmate’s name and the prison address. Prison food isn’t exactly described as haute cuisine at the best of times - especially not by farang with Western tastes in Thai jail. But with money in their accounts, inmates can buy much needed, nutritious, extra meals from the prison shop. It can take a month to set up a new inmate’s account. It may be a case of asking politely at the prison pay-in window until finally, one day, you get a yes, their account is open. As soon as they have money in their account, they can spend a daily limit of 300 baht. * Whenever we visit we try to spend a couple of hundred baht per inmate, paying into accounts and buying luxury essentials like water, peanuts and coffee. If you can afford more than that, great. Maximum deposit is 5000 baht per visit. 1) PayPal to kohsamuiinmates@gmail.com . Put your friend’s name in the comment field and we will make sure that he receives it, either on a visit or by post. 2) Go to any Thai post office with the same info you would need to send a postcard - his name and prison address. Ask to send a money order by EMS. Don’t send more than the maximum 3000 baht, and yes, we can confirm it always arrives. Finally, come and support us at Bizarre Bazaar! Look for the donation box at Seaboard Bungalows’ weekly flea market. Grab yourself a beautiful bargain and help someone out in the process! 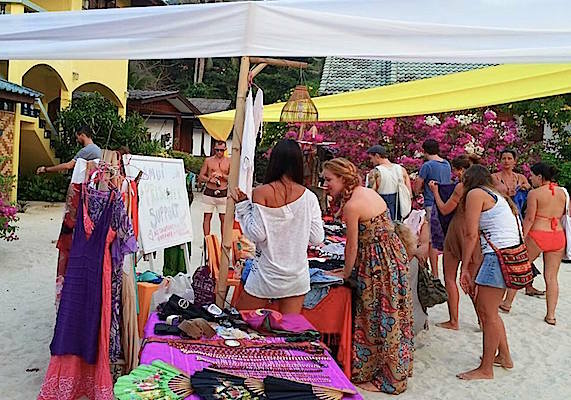 At the Samui Prisoners Support stand all donations go towards buying food and water for farang prisoners in Koh Samui jail - and beyond. For those actively wanting to help their friends in crisis, find Samui Prisoners Support group on facebook. It's intentionally a small group - a safe haven for inmates' families - but those who really want to help their friends are always welcome to join! And if you need more info, hit me up! 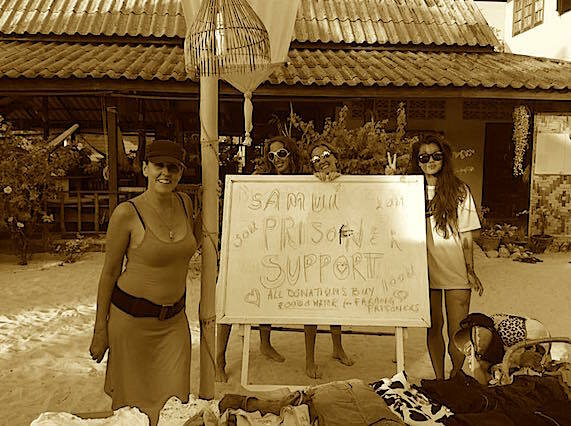 More info on the Samui Prisoners Support page.